Arsenal Football Club and digital money transfer experts, WorldRemit, are offering local coaches the chance to attend an exclusive new training camp with Arsenal’s top youth coaches in London. The shortlisted 25 coaches are to be rewarded with Arsenal kit. 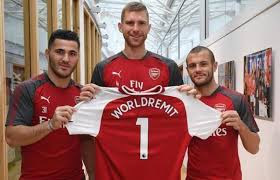 WorldRemit will arrange for the successful applicant to fly to London, where they will attend an exclusive training camp with Arsenal Soccer School’s coaches. During the camp they will work on plans to use the training to build a lasting legacy in their home country. The camp will be free to apply for and open to youth team (under 16s) coaches from across Africa. Coaches simply need to complete the short online application form at www.futurestars.worldremit.com by August 27 explaining why they deserve to be granted this unique opportunity and the legacy they plan to build on their return home. Speaking on the programme, the CEO of WorldRemit, Ismail Ahmed, said apart from the organisation making sending money easier, they also help their customers do more for those they care about. “When we set up our partnership with Arsenal, one of our goals was to reward hard-working individuals within the community. Football connects people from all walks of life so this was a natural place to start,” he said. On his own part, Simon McManus of Arsenal Soccer Schools said: “In this Centenary year of Mandela, it is a fitting time to recognise and reward those individuals who have harnessed the power of sport for the benefit of young people across Africa. “A strong commitment to the community is one of the values we share with our partners at WorldRemit and together we hope to build a lasting legacy and to shine the spotlight on these unsung heroes who give up their time to help to deliver a brighter future for others.